I first met Levi when he my head counselor in camp, he was by far the most entertaining head counselor I have ever met. Everyone always wanted to be around him, he was the center of attention, and with his steady stream of jokes, the many strengths of his personality combined to give such a great feeling to camp that it remains indelible to this day. I remember clearly standing outside my bunk Friday afternoon right before bedside inspection, hoping that Levi would be the one to come and inspect our bunk, because we all knew if Levi came it would not be “bedside inspection”, but “bedside activity”. And let me tell you it definitely was an activity… I remember him going over to someone’s bed which had a very nice appearance on the outside; he looks at the boy and says: looks good on the outside let’s see what we have under it…. He then threw off his cover and revealed around 100 candy wrappers lying all over his sheet… Levi looked at him and with a strong serious voice said: “why on earth did you move the entire canteen under your bed”. My whole bunk started to laugh so hard we could not control ourselves for the rest of the inspection… Needless to say our bunk lost points for cleanup. That was Levi making a serious inspection into an unforgettable activity. I recall when we would wait on Friday nights hoping Levi would be chazzan, what a pleasant davining it was - of course it had a Levi twist to it, making people giggle throughout Marriv. After the camp experience I had a long break of seeing Levi, the next time I saw him was when I came with Nosson to do merkos shlichus in VA. Unfortunately Levi was not doing very well at that time, and we did not get a chance to talk much. But the little that we did speak and the great deal that I saw, had me inspired for a long time afterward’s. A man who was totally selfless, a man who was going through a lot of pain, but yet always had the time to ask other people how they were doing and always with a smile as though all was well, even when the situation was indicating otherwise. Levi always wanted to know what was going on in Shul, and he always had a good word for all the people that came to see him, so that they always left in good spirits. They would come to cheer him up, but it was he who comforted them. Then came the tragic passing of my best friend Nosson, it came down on me like a load of bricks. The first day I walked into Shivah and walked over with my head bent down to Levi. He looked at me and gave me a slap on my back and said “don’t worry Eli, you’ll be all right” it had a really profound impact on me. Here again I had come to give comfort, and it was I who received it. I can only hope and pray that we know no more troubles in our life, and very soon we will run to greet Levi and Nosson with the coming of Moshiach, may it truly be speedily. 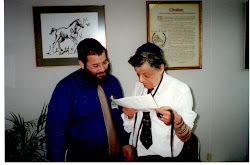 This blog is dedicated to the memory of Rabbi Levi Deitsch, the Rebbe’s Shliach to Tysons Corner, Virginia, who tragically passed away at the age of thirty four on Shabbos afternoon parshas Vayeitze, after a long illness. He is survived by his wife and four children. Open Letter to my son , Geoffrey. Levi made you feel so special! THIS IS THE TZIYUR OF A CHASIDISHE BOCHUR! Energetic with a Positive outlook!